Happy Easter to all Christian type people. 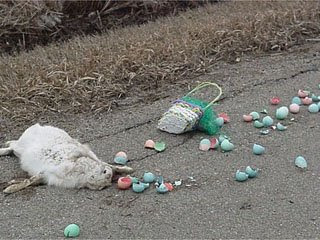 Warning, if easily offended, do not look at the above image, in which the Easter bunny has been brutally murdered by some kid who didn't get his Cadbury's Creme Egg. Hope you didn't get any of those for Easter. wah? we don't even have an easter article? pathetic.